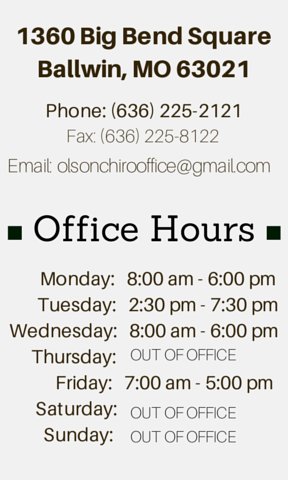 To share your own experience, contact us at olsonchirooffice@gmail.com! Starting Chiropractic treatments (adjustments, herbs & acupuncture) with Dr. Olson Many years ago was one of the very best things I ever did! I continue to see Dr. Olson on a regular monthly basis to maintain the improvements we've made in my overall health. My asthenia Gravis is a muscle weakness disease and when I began seeing Dr. Olson, I was experiencing many muscle weaknesses. Depression was also one of my main difficulties. Dr. Olson told me when I began treatment that he felt he could bring me to approximately 80% improvement in my condition. The improvements have come steadily along, despite other health interferences. It's with a great sense of gratitude to Dr. Olson and his staff for their help that I share my testimony. My health has improved greatly since I began chiropractic treatments with Dr. Olson. I was diagnosed with psoriatic arthritis in 1998. This was after a stress-filled three years of being a caregiver for my mother who has Alzheimer's disease. I became sick with flu like symptoms for a period of 2-3 months. The joints of my fingers and hands began swelling and caused intense pain. I made the rounds of M.D. 's whose prescription's side effects were unacceptable for me. A doctor of rheumatology wanted to have me use a cancer drug to control the swelling. I did not take the drug because of the serious side effects. By this time all my joints began to swell. I had to find a better way to get relief from the pain. I read an article in Alternative Medicine Magazine about JMT treatment for arthritis. This was what I was hoping for. Dr. Olson's name was listed as a practitioner of JMT. When I started going to Dr. Olson for the JMT treatment I could hardly walk, go up or down a step, or really move any joint in my body without great pain. After several months of JMT treatment by Dr. Olson I am happy to say I can walk without pain, I can put gas in my car and do more things around the house than I have done in a long time. I am so thankful and blessed that I have found treatment from Dr. Olson and his chiropractic staff I just wish more people knew about this alternative way to achieve better health. While talking with my Aunt about my arthritis symptoms she recommended that I find a doctor who was N.A.E.T. Certified in my area as she had had remarkable and amazing results with her treatments for candida. So I went to the website (http://www.naet.com) on the Internet she told me about and found Dr. Olson in the St. Louis area which is two hours each way from my home. For years I had suffered with muscle and joint pain with extreme stiffness especially in my back, ankles, and hands. Some mornings I would be so stiff that I would have to stand in a hot shower just to get some mobility back enabling me to function for the day. My ankles would make snap-crackle-pop noises while walking and especially while going downstairs. The joints on my hands are enlarged like my Grandmother's and they were swollen, reddish-purple, and looked like I had been in a fist fight with a brick wall which is what they felt like most of the time. I could no longer open the simplest jars and I use to be the one everyone brought the jars to that they couldn't open. I was taking Excedrin's, acetaminophens, and occasionally ibuprofens like they were candy just to get some relief. After my initial consultation visit with Dr. Olson he recommended JMT treatments and gave me an article to read entitled "Reversing Arthritis with the Jaffe-Mellor Technique" found in the November 2000 issue of the Alternative Medicine magazine to read. The rest is history; I started my JMT treatments in March of 2002. I am currently free of pain; my hands are not red and swollen anymore; my ankles no longer make noise while walking and they are not nearly as noisy going downstairs; I have more flexibility and mobility in all of my joints; I can do things that I haven't been able to do in years; and I have not had to take pain relievers for my arthritis since midsummer 2002. It's wonderful! It feels good just to feel good again from the inside out. I will forever be thankful and grateful to Dr. Olson for recommending the JMT treatment for my arthritis. The quality of my life has dramatically and significantly improved. I highly recommend JMT treatments to anyone who is suffering and gladly spread the good word when the opportunity arises." When I first came to Olson Chiropractic, it was extremely difficult for me to even get out of bed. My neck, shoulders and back hurt so much that just sitting up and moving was an effort. After each treatment, it seems to get easier and easier. I fell more comfortable and have more mobility. Dr. Olson treats the whole body, inside and out. He helps me to be congruent on all levels. He is very perceptive and caring. Dr. Olson really listens to what I have to say. On my first visit, I told Dr. Olson that I felt that my body was talking to me, but no one was listening. I had seen other doctors and told them what I was experiencing, but they dismissed me as if I were imagining my symptoms. Dr. Olson just smiled and told me that I should always listen to my body because it is talking to me. I feel that I have finally found a doctor who cares and is able to help me to reach and maintain optimum health. Coming to Olson Chiropractic has been a life-changing experience for me. I have experienced a marked change in my physical health, but also a profound change in my emotional outlook. Everyone here is professional and caring, and Dr. Olson is, in my opinion, the most gifted practitioner I have seen. The book, classes, and talks are a real eye-opener. The footbath is very interesting, and I feel a lot calmer. The people working here are some of the nicest people you can ask for. Dr. Olson has been treating my family for several years now. He has been both a physical healer and an emotional healer for all of us. His gentle nature and uplifting spirit have truly been inspirational in causing me to evaluate my life-in priorities, in better health, and in overall quality. Our lives are richer because he is in it! Dr. Olson gave great and excellent explanations for his treatment and good communications with his patient. These make me feel very confident and comfortable while in and during the treatment process. He thoroughly understands what he does and gives detailed guidance to the patient on how to exercise at home which greatly improves the healing results. Kindness, knowledge, and experience make his therapy treatment very successful. Finding Dr. Olson has been one of the great joys in life. My health has improved markedly. Acupuncture, added to the necessary adjustments, has given me a balance I never had. My life will never be the same. Last week after lying down in the evening after my treatment, I had an uncontrollable urge to keep stretching my legs. My left leg, which had been stiff and hard for so long, felt great! For the next couple of days, it felt like I'd never had knee surgery! Some of the stiffness returned, but not to the previous level. With further treatment, I expect it to keep improving! I was really nervous on my first day because I had never visited a chiropractor. Of course, I was so nervous that I cried. Dr. Olson made me feel very comfortable and I really like and enjoy my visits. The staff is very wonderful and treat you like an old friend. Dr. Olson and the staff and I have exchanged a number of books and enjoying talking about them. I have told my friends about Dr. Olson and how much he helped me, and I would recommend him to everyone. I enjoy care at Dr. Olson's office nearly once a week. I don't come so often because of an ache or pain, or any type of symptom. I come because Dr. Olson is an extremely special person with great God-given abilities to serve mankind by giving him a greater awareness of things both temperal and spiritual. I find this office to be the perfect place to gain a better perspective of things, as well as a place to enjoy a side of healing that I have only recently come to know...emotional and energetic and spiritual. This is a place of healing and rejuvenation. By sharing this opportunity with others, I feel that I am extending them help that they can find nowhere else. I began treatment with Dr. Olson for joint pain I have been experiencing since the birth of my daughter. I have met with a handful of doctors since the pain began. We had been unable to diagnose the problem. Each doctor I visited wanted me to begin some type of medication-pain or anti-depressant. I became more frustrated as the years went by. Dr. Olson came into our lives when the pain was at its worst. I felt as though I had nothing to lose by giving it a shot. I initially had a visit and was not quite sure what to expect. His theories made so much sense, and I was willing to give it a try. Dr. Olson takes so much time with me. My body seems like a mystery. He is the first professional that has been able to provide me with relief from the joint pain. He has given me new perspective on life and health. I am so grateful for his time and patience with me. Everyone in Dr. Olson's office exudes a genuine warmth, so walking in the door is healing in and of itself. Dr. Olson's 5 part approach, S.E.N.S.E., has helped me heal on all levels-spiritually, emotionally, nutritionally, structurally, and energetically. In the past two months since participating in this program, I have experienced growth and healing in every facet of my life. When the student is ready, the teacher appears. It is an honor and a privilege to be ready to work with such a healing, compassionate, talented, and knowledgeable teacher as A. Rand Olson. Today, driving to my appointment I thought I would feel better if I could just remove the left side of my head. I told Dr. Olson about this headache and, after placing the needles and before he even left the exam room, my headache was gone. Driving home was so much more comfortable than driving here was! Dr. Olson has helped me through numerous health problems, including a boating accident, a blood clot in my leg, and stress! Chiropractic healing is the way to a healthy life. Chiropractic keeps me feeling energized and well.